Hollywood has been warning us against this for years. From 2001: A Space Odyssey to Star Wars to the television series Futurama, sci-fi writers have always been fantasizing about the role of robots in the future. They’re sassy. They’re smart. They’re homicidal. Sure, using humans as generators doesn’t make sense if you know much of anything about thermodynamics and how the body works—but just try to explain that to your robot overlord! Don’t tell me you missed the subtext! “Burn the forest,” says the villain. 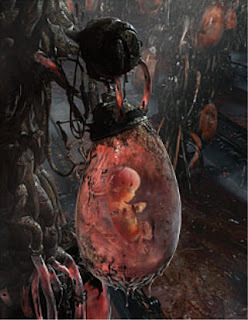 Start manufacturing weapons and armor and scorch the earth a black that can’t grow back. Obviously Saruman’s slave force and Sauron and the Ring of Power represent the Middle Earth equivalent of our big, bad industries and robots. Who are the heroes? The quaint short people with green thumbs. You don’t want to end up like Frodo almost did when he so poignantly said, “No, Sam. I can't recall the taste of food, nor the sound of water, nor the touch of grass. 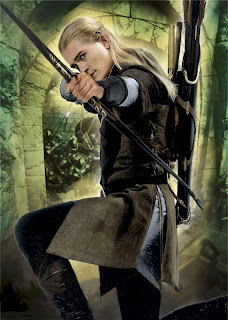 I'm naked in the dark.” Every time I kick a vending machine because it ate my dollar, I’m like Legolas shooting an orc in the face. Probably one of my favorite movies of all time. The kind of flick that has you leaving the theatre pretending to be a velociraptor. But if you think about it, the message is clear: too much automation and t-rexes start eating people off of toilets. Maybe we should be careful about trying to genetically engineer and reconstruct pre-historic carnivores, but more importantly DO NOT PUT ONE ORNERY, EASILY-BRIBED COMPUTER SCIENTIST IN CHARGE OF ALL THE DINO CAGES! Chances are he’ll write up some computer code to do all the hard work and then get eaten by a dilophosaurus before telling anyone his password. Learn from history….er, Hollywood. Machines have been edging people out of the workplace since… machines existed …and there was a workplace. The Industrial Revolution just took it to the extreme. Specialization. 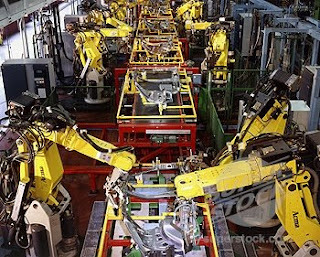 Ford assembly lines with conveyor belts. Machines are just better at making machines. But are the service industries in danger, too? Busy people want convenient technological tools and toys. Raise your hand if you’ve ever walked into a Starbucks and thought some dude was talking to you, only to come to the shameful realization that he was wearing a Bluetooth headset and was on a long-distance conference call with the Japanese CEO of whatever, inc. Yesterday’s phones allowed you to skip all that nasty face-to-face, eye-to-eye human contact. Today’s cell phones let you do it on the go. Better yet, send a text message. Now you don’t even have to listen to that disgusting human voice. Just look at this guy. 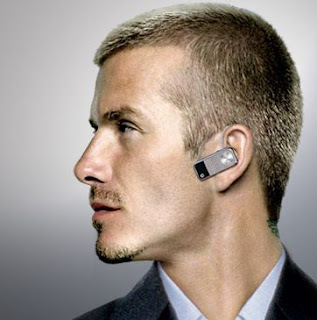 The new business professional is a sleek cyborg. I don't use words like "douche" in civilized blog posts. I dream of the day that I can wake up, live a full day, and return home without seeing another person. Tinted windows. Noise-canceling headphones. Online shopping. Every day my dream gets closer and closer. It’s obvious that other people share the dream, because the marketplace is responding. Whether you realize it or not, you’re a victim of the very real robot revenge. Smart Tags. EZ pass. Alright, paying tolls stinks. But now you don’t even get to hand your money to that cheerful, hardworking whoever and compliment her on her matching neon-yellow reflective vest and jumpsuit. Just stick this little electronic transmitter thingy on your windshield and every time you pass through the fast lane to get on or off the toll road your account number is beamed up to the mother ship where you are charged accordingly. The machines track your progress. The Matrix has you. The self-checkout. I thought ATMs were just the next logical step from Cola vending machines. Combine the two and you get a machine that can take your money, run a transaction, and ask you if you want cash back. “No, thanks. I’m on a tight budget.” No reply. You can walk in, purchase, and walk out without even stepping into earshot of another person, if you’re lucky. Forget about service with a smile...shiny buttons! 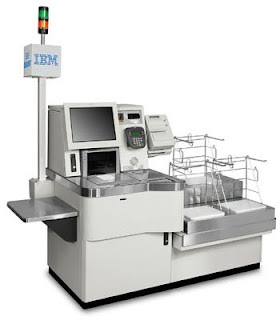 Sometimes I don’t place my items in the bagging area at the self-checkout just so I can hear that sweet, ladylike machine voice admit that it needs human assistance. “Whew…thought I was all alone in here.” After the nuclear Holocaust the only things left will be Hondas and cockroaches. But if a Safeway supermarket survives the boom, I’ll still be able to buy my groceries. Those touch screens are nifty! Calling the movie theatre the other day brought my attention to another front on the battlefield of Man vs. Machine. After literally five or six sub-directories and menus, which I navigated through using my keypad (machines speak in numbers), some recording told me some show times and then hung up on me. For serious? All I wanted was someone to talk to. Someone to hold me and tell me everything is going to be alright. When I called FedEx to figure out where I needed to go to ship a last-minute package towards the end of the business day, the machine lady actually asked me for the name of a town or city and it’s corresponding zip code. Then she asked me to answer a couple of simple “Yes” or “No” questions. Oh, great. Voice recognition is now allowing the machines to imitate our good manners and conversational charm. Now they’re here to stay. Enrique has written 1 post. Here it is. To give him credit, he did have another draft ready that he never finished about the Montauk Monster. That should be forthcoming in the next year or so. John has not written a post yet, but he has been the inspiration for at least one post: this one. dreamcatcher has written one post, and it was great. Here it is. Jimbo's first post follows this one. The rest of the posts have been written and inspired by my strange mind. However, if you haven't read all of them, some are obviously better than others. On the right side of this blog you can check out the archives. You'll probably find at least something to laugh about or something that will make you think, or something that will leave you ridiculously angry or inspired. PS - I already read the book that inspired Rambo (First Blood), and am now reading Deliverance for my last class at BYU. Jealous? Well it took decades, but finally hospital food has its Elvis. Green jello with marshmallows. For the longest time the best thing going for hospital food was apple sauce and the occasional saltine crackers, BUT NO LONGER. Move over apple sauce. 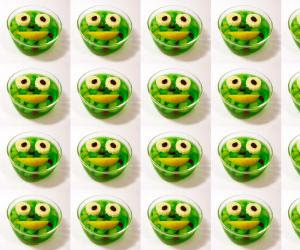 It's green jello marshmallow time. "It's a hit with all of the people in here who can't chew or have stomach ailments. Heck even I'll sneak in a spoonful or two when nobody's looking." Cheryl is not alone. Apparently green jello with marshmallows was a hit at the hospital staff cafeteria. "I just can't keep up with demand. I have to churn out about 60 5-gallon bucket-fulls a day....Oh and don't tell the Dr. Schminkler, but I take a bucket home every other tuesday," said Maureen Benton, chief chef at Franz Schwimer. "It's really weird man. I think they have to be lacing it with something. I mean, just a month ago it was just green jello and they would give you the optional bowl of miniature marshmallows if you were good, but now that they've combined the two they act as if it's some sort of culinary revelation. 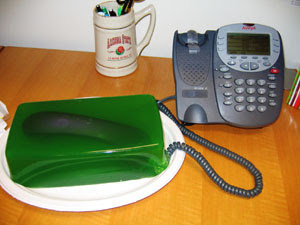 For the record, I think green jello is overrated." Unfortunately for the employee I interviewed to get that quote, he was overheard by the head RN, and told to turn in his two weeks notice. Sorry Brian. It has not stopped snowing here in Provo. It began yesterday. Bear in mind, I like snow. In fact, I would not mind if there were a blizzard outside. Basically, as long as it's in the right season I'm down with it. But, there is something I find a bit ridiculous about this snow and Utah. As most of you know (or perhaps you have no idea), on license plates out here in the great state of Utah there is a phrase. It says "The greatest snow on earth." Now, I'm not about to dispute that, but I do find a bit lacking for a place that had the winter Olympics in 2002 and a slogan like that to not have sufficient snow removal services. For the past two days the streets have been caked with powder, slush, and ice. 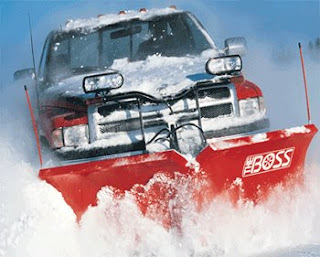 Occasionally plows come out and do their job, but their service is infrequent at best. Now, to juxtapose that with snow removal in Massachusetts - where at the first sign of a winter storm plows are grinding the pavement with sparks flying - Utah is inept. I really don't get it. Maybe they pay the plow drivers more in Massachusetts. Maybe they have more plows, sand, and salt in Massachusetts. I do not know. All I know is that if Utah is going to say it has the "greatest snow on earth," it better have the greatest snow removal services on earth to match it. I mean, it's not like Utah is not familiar with snowy streets. If they were going to take their slogan seriously they should have diamond snow plow blades encrusted in gold, to plow that beautiful Utah powder. Will it happen? Yes. When I become governor (which will be never). It's days like today that make me glad I don't live in Minnesota. 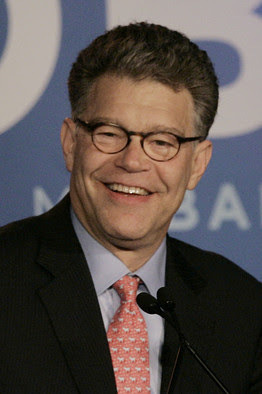 It seems that Franken has been declared the winner after a shifty, inconsistently run recount that added votes to only his camp and subtracted votes from Coleman's. As it turns out, the message we can learn from this is that some people's votes can be counted multiple times without any one batting an eye, while others cannot have their vote count at all. That's democracy inaction. Here's an article about it in the Wall Street Journal. However, it's not all about recount irregularities. As it turns out, the man in charge of the recount, Secretary of State Mark Ritchie, has used his sway to tell the canvassing boards to halt the count of the disputed ballots, and declare Franken the victor. Bear in mind that only a few weeks ago Franken was talking about having every vote counted. Now, as it turns out he only wanted votes in his favor counted, and when he got his politically motivated result, he wanted the process stopped. I'm sure some of you think that I'm just bothered because Coleman did not win. That is not true. I would be fine with either candidate taking the seat with a legitimate recount. But that's not what happened here. This is almost like Chicago or Louisiana politics. No longer is the democratic process reified, but it is abused, extorted, thwarted, and in essence nullified. Unfortunately there is no legal ground to just hold another election, which, in my opinion would be the fairest course, given how miserably tainted the recount has been. So, it seems that if you have the secretary of state, and a couple of district canvassing boards on your side, you can make the election work out in your favor and steal a senate seat. It doesn't matter if the recount shows more votes than there are voters in the precinct. You've got your result.